The focus of the organisation is to give the precious gift of education even to those who have no access to any educational institution due to lack of means and awareness. Our aim is to reach out to those who can’t think of a life other than that they are living at present. From many generations together their fates have been doomed to live a life that is totally cut off from education, society and culture. They can’t think of a world beyond their forced filthy dwellings. Parents, being very poor, are whole day busy selling on roads dusting cloths, balloons bouquets, petty toys. The income from this sale is so low that the whole family, including women and children, have to do something for the bread and butter of the family, which is usually very large. Not only adolescents and adults but even eight-nine-year-old children have to do something from begging to selling petty clay, paper or wooden toys . They live in an environment where even a dream of education is not within their reach. Quite a few inhabitants in slums or under flyovers have serious health problems like asthma, tuberculosis, gastroenteritis etc. They suffer from fatal diseases but don’t go to hospitals for treatment. Therefore ,the NGO, Blue Pen tries its best not to let anyone die or suffer for lack of proper treatment. The organisation has thought of giving some vocational training to adolescents and adults of these flyovers and slums by engaging part-time trainers for them so that they can earn their living in a more dignified way. Blue Pen also wants to use all possible technological tools and facilities to raise the standard of living of these poor people. They are shown documentaries, cartoon films and didactic movies not only to lure them to the education we want to give them but also make them move abreast of their more fortunate counterparts. To sum up, we can say that Blue Pen is committed to bringing happiness in the life these poor people through ensuring all round upliftment-physical, economic, social, educational and cultural. 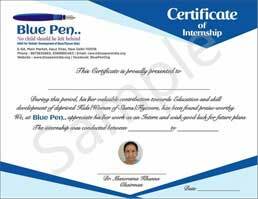 A very important objective of Blue Pen is to give vocational training to the adults, esp. women. For the purpose, we plan to employ a few vocational trainers to teach them stitching, flower making, menhdi designing, mobile repair, cycle repair etc. on regular basis. Blue Pen will also help these adult dwellers of flyovers and slums to set up their own shops to earn their livings.